Montserrat, the mythic holy mountain, jewel of Catalonia. The famous "Monestir de Montserrat" (Monastery of Montserrat) is the center of the Catalan faith. Pilgrims retreat here for "La Moreneta", the Black Madonna, listen to the boy´s choir, view famous paintings and meditate in the stillness of the mountains peaks. Enjoy a ride on the Sant Joan Funicular Railway which offers a unique experience with the best panoramic bird´s-eye views of the mountain and the Monastery. Montserrat is a multi-peaked mountain range near Barcelona, whose main peaks are Sant Jeroni (1,236 m), Montgrós (1,120 m). "Montserrat" literally means "saw (serrated, like the common handsaw) mountain" in Catalan. It describes its peculiar aspect with multitude of rock formations which are visible from a great distance. The mountain is composed of strikingly pink conglomerate, a form of sedimentary rock. To some it is a monastery, to some it is a natural park, to some it is a mountain and for others it is all of these things. Whatever your reason for coming to Montserrat, you will be amazed by its unique beauty and spirituality. In 1987 Montserrat Mountain was declared to be a natural park by the Generalitat de Catalunya. It is a place that is of interest for its vegetation, wildlife and climate. During your trip to Montserrat it is definitely worth trying to schedule in time for a walk around the natural park. Drive through the picturesque little villages of the province, we come to the incomparable setting of the mountain of Montserrat, rising majestically to 1,235 metres. You will take with your guide the Sant Joan Funicular Railway up to the top, which offers a unique experience with the best panoramic bird´s-eye views of the mountain and the Monastery. 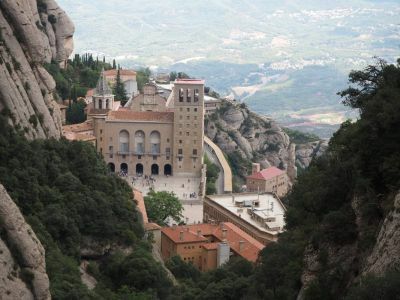 Visit Montserrat: The Basilica of Montserrat, which hold the famous Moreneta, a 12th century Romanesque carving. Drop off back at your hotel or cruise ship port (other city centre location on request) and say the final goodbye.